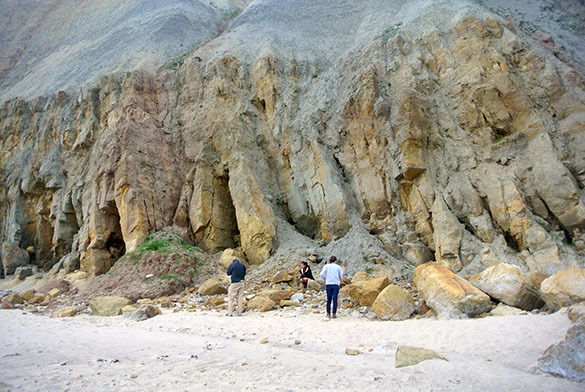 SCARBOROUGH, ENGLAND (June 8, 2015) — When we do field Independent Study projects in the Wooster Geology Department, we never know the exact topic until we’ve tested ideas on the actual outcrops. Today we did the last of our general exploration, and then at lunch Meredith Mann (’16) and Mae Kemsley (’16) decided on what they wanted to do for their projects. 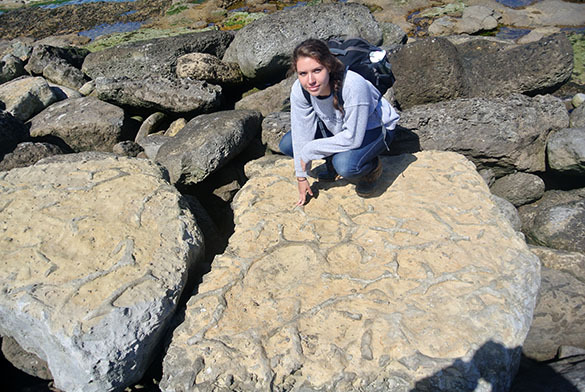 Meredith chose to study the fossil community associated with Thalassinoides trace fossils in the Birdsall Calcareous Grit Member of the Coralline Oolite Formation (Upper Jurassic, Oxfordian) at Filey Brigg. She’s shown above on one of the exposed bedding planes she will soon be examining in detail. Mae’s choice? You’ll read it here tomorrow. 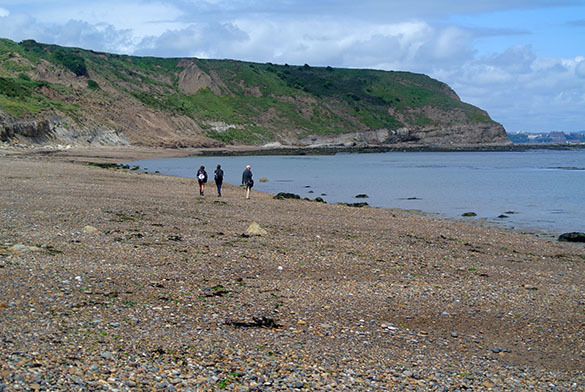 We started our day in Cayton Bay, south of Scarborough. We had a long walk at high tide from our car south along the coast. After we hit the boulders in the middle of the view above, we saw no one else for the rest of the morning. The cliff is capped by Oxfordian limestones, with the thick Oxford Clay beneath. We had a few drops of rain while in Cayton Bay, but they didn’t develop into more than a sprinkle. We couldn’t cross the boulder field (boulders and steep slopes are a theme of this expedition) until the tide receded a bit, so we spent some time examining this cliff exposure of the Osgodby Formation (Middle Jurassic, Callovian). We crossed over Yons Nab (you just have to love these English place names) into Gristhorpe Bay to the south. Again, no other souls on this sunny day. After a quiet lunch, we retraced our route back to the car. The general reconnaissance is done. Time to start our work. Back to Filey Brigg. 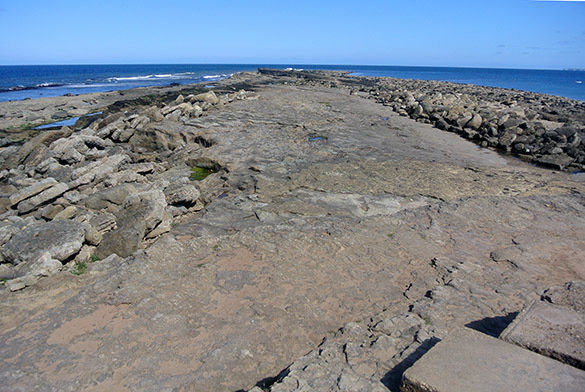 This is a view down the axis of the Brigg as it enters the sea. Note what a spectacular day it is. Our job this afternoon was to work out the protocols of Meredith’s research, and pick her work sites. This is a beautiful exposure of the Birdsall Calcareous Grit Member on the north side of Filey Brigg. 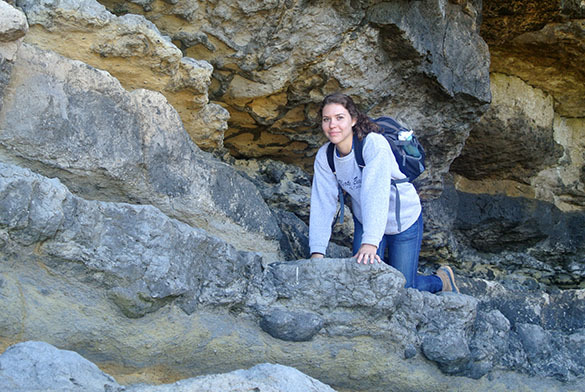 Note the Thalassinoides in place above Meredith. 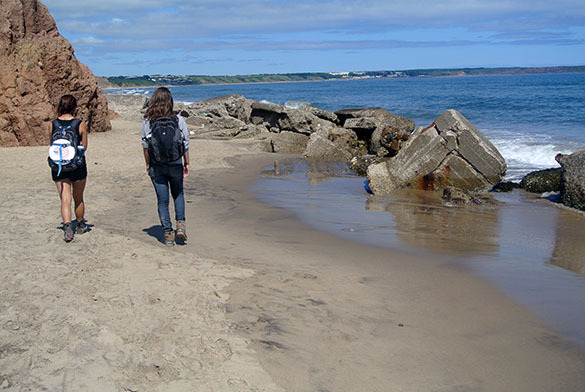 Meredith will be measuring and describing a section of the units here, and doing her mapping and collecting on the loose block along the Brigg itself. Tomorrow we start Mae’s project! 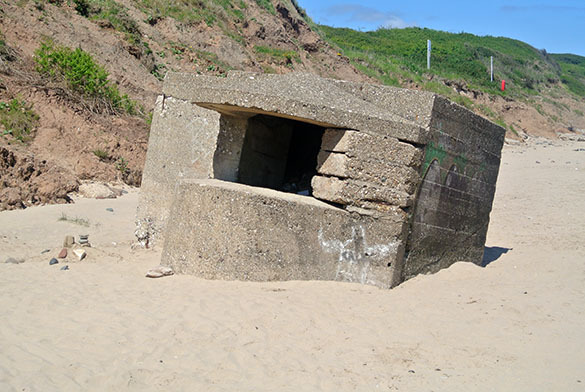 SCARBOROUGH, ENGLAND (June 8, 2015) — We see many of these World War II concrete defenses along the Yorkshire coastline. 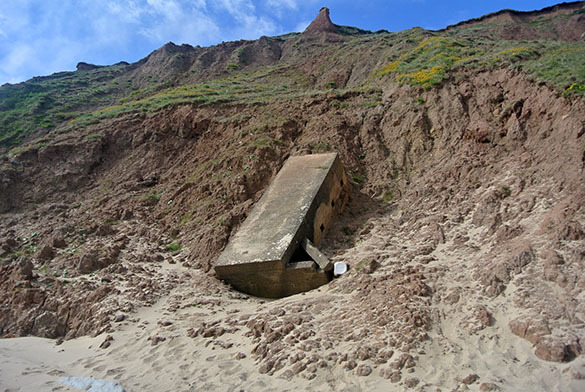 This is a pillbox that was likely constructed in 1940 to defend the realm from the Germans. Of course, it was not placed on the sandy beach but up on the steep slopes overlooking the shore. Erosion of that headland since 1940 was complete, leaving this structure on the open beach. 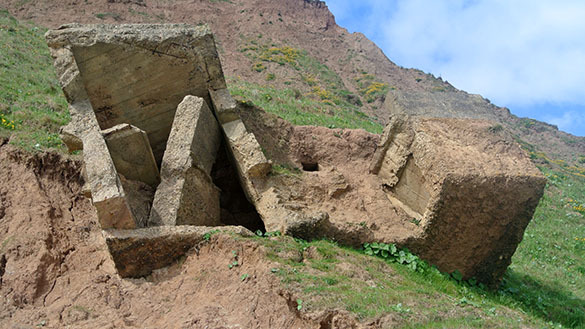 It is a dilemma, building on these sea cliffs of the northern Yorkshire coast. The substrate here is a “boulder clay”, a Pleistocene glacial deposit known as a diamictite. It is easy to excavate, but flows readily under weight and when wet. 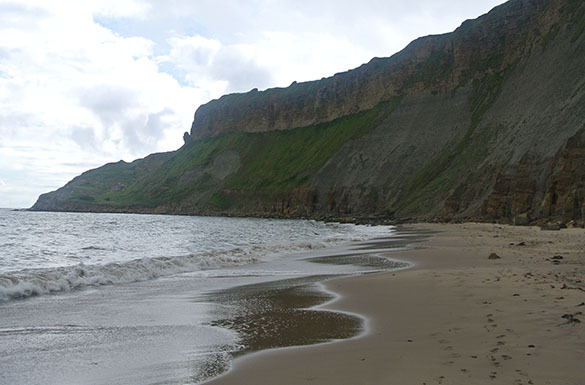 The sea hammers away at the foot of these soft cliffs as their tops slump downwards. 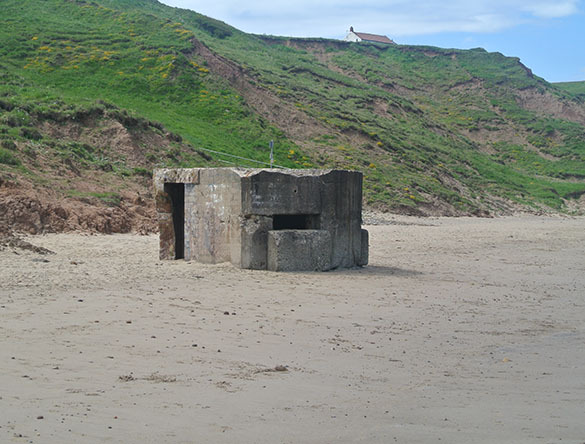 The heavy concrete gun emplacements and observation posts serve their purpose for a few years, and then eventually fall into the sea as the coast retreats. 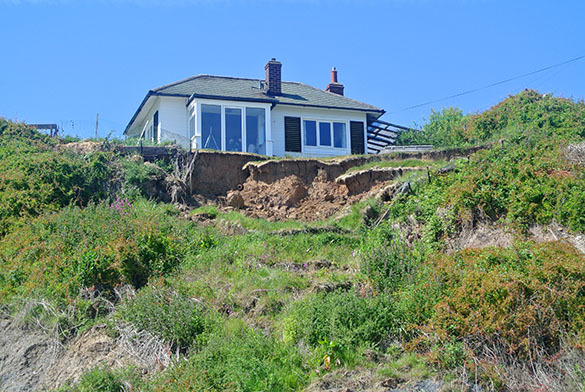 Seventy-five years of coastal erosion has removed a great deal of the cliffs. Given what you’ve seen above, would you buy this seaside house?